Driving your jeep in modern traffic is a safety hazard. 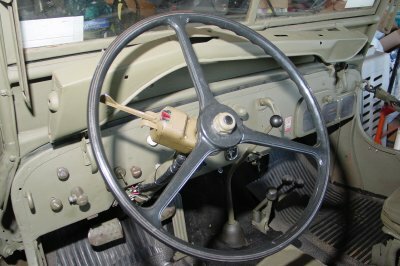 Sure your are whipping your arm out the side either straight out or up at 90 degrees…but what does the modern driver think your doing? Most likely that you are flipping him off! So the thought quickly comes to mind to add some sort of turn signals. I use to have really large indicators and auxiallary brake and tail lights but now I have substituted LED lights. These are fairly small but very bright. The signal device can be purchased from JC Whitney among other places. Part Number 13ZX8973N is the one I used. I painted mine with the same 319 OD lustreless paint that I used on the jeep. The first problem, I quickly discovered was that the LEDs do not draw enough current to fire the flasher unit. A friend in the UK, “Wookie”, developed a flasher replacement unit on a small circuit board. After receiving it, I installed it and most likely fried it because I hooked it up in series with the original flasher…and I wasn’t suppose to. So what did I do? Well, all you have do to is install two marker lights that use the size 67 bulb. These coupled with the LEDs draw enough current to fire the flasher. I also replaced the old fashion mechanical flasher with an electronic version…Tridan Stant 12 volt 3 terminal (EL13). It workds great! The front bracket was made from 18 gauge steel, basically cut to about 1 inch by 6 inches and then bent into a twisted L to fit under the fender. 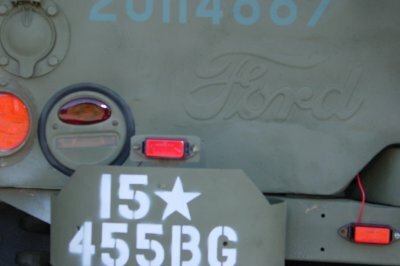 In this picture you can see the T shaped bracket that holds the signal and also the extra tail lights that have been placed on either side of the pintle hook. 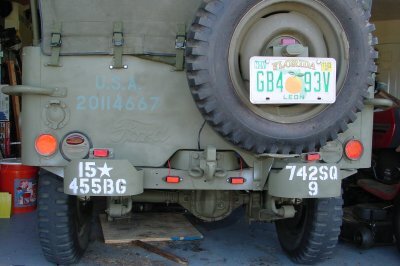 You can also see the license plate holder original designed by Jon Rogers of JeepDraw fame. I Americanized it and added a brake light on top (another one of those LEDs). Here is a close up of the LED and bracket. These are very bright, especially considering there size. It will make your journey much safer. 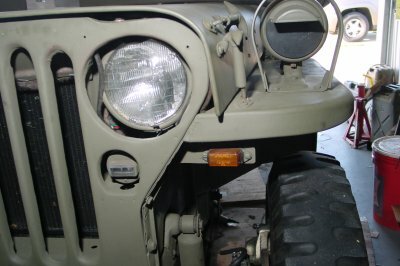 You can get the same LED marker lights that I used from www.unifiedmarine.com. The part numbers for the LED Clearance Light Amber is P/N 50080277 and the LED Clearance Light Red is P/N 50080279.